Don't eat that nutritious bread because it's too high in salt. I'm so over news reports that attack one nutrient and raise people's anxiety around food. 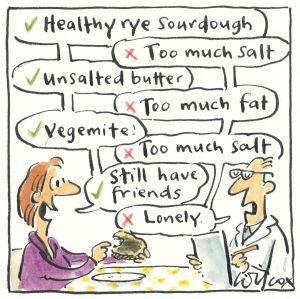 "Alarming levels of salt found in 'healthy' breads, say researchers"
They report that the nutrient-dense breads such as wholemeal and rye breads can contain ~1/3 of a person's daily salt intake target. Should you, then, cut out these breads from your diet? What else are you cutting out when you cut out these nutrient-dense breads? You're cutting out fibre and resistant starch (important for gut health). You're cutting out iodine (important in pregnancy). You're cutting out unsaturated fatty acids (important for managing healthy cholesterol levels). You're cutting out carbohydrate, an essential fuel for the body. In fact, whole-grain intake is associated with reduced risk of cardiovascular disease, coronary heart disease, hypertension and type 2 diabetes. Whole-grain intake is also associated with better gastrointestinal health. Have a look at what other foods you eat throughout the day. Fruits, vegetables, legumes (beans and pulses) and nuts. These foods are great source of potassium, which can help you body get rid of excess salt. Fish, lean meats, milk and yoghurt are also good sources of potassium. Just because you eat bread high in salt doesn't mean your whole diet is too high in salt. If you were grazing on chips, bacon, cheese, biscuits, pickles and dips all day long then yes you're probably getting too much salt for your body. You'd probably be really thirsty too. If you have a heart or kidney condition then you can be given a salt restriction as part of the treatment and following this would be important. In such instance I (dietitians in general) can help you achieve salt reduction with minimum compromise to enjoyable eating. Otherwise don't be too alarmed. If you're eating from a variety of food groups - wholegrains, vegetables, fruits, legumes, nuts and seeds, fish, meat/poultry/eggs, and dairy and alternatives - then you're eating is beautifully balanced.